As part of its lauded Climate Action Plan, the city plans to get half of city residents who live near a transit station out of their cars and commuting by transit, biking or walking by 2035. But a tool the city is about to give planners to help determine whether development decisions comply with the plan won’t report how people in each community commute. San Diego’s long-term climate goals rely heavily on one thing: building lots of homes and businesses near transit stations. It’s the primary way the city plans to get half of city residents who live near a transit station out of their cars and commuting by transit, biking or walking by 2035. That’s one of many goals the city needs to make good on to cut its carbon footprint in half in the next 20 years. That’s not just an aspiration: The city is legally bound to do this because of its celebrated Climate Action Plan. But a tool the city is about to give its planners to help determine whether development decisions comply with the climate plan won’t report whether new community plans individually match the city’s goals for how people get to work. Instead, it’ll focus on whether plans decrease how many miles the typical person drives on an average day, another goal in the city’s climate plan, and use how people commute to help inform those decisions. The City Council’s environment committee Thursday is discussing the new tool for city planners. In a memo outlining how it’ll work, city staff argued that focusing on vehicle miles traveled, instead of the share of people commuting by specific types of transportation, makes more sense because it is a more direct measure for greenhouse gas reductions. They also say it’s the right choice based on technological changes from companies like Uber and Lyft and autonomous vehicles. “Traditional share of automobile, transit, walk and bike travel may shift as new technology emerges, and keeping these as the city’s targets may limit the city’s ability to achieve its primary goal of reducing GHG emissions,” according to the memo. But the change also comes after the city adopted new community development plans in Uptown, North Park, Golden Hill and San Ysidro that each failed to meet the city’s ambitious goals for how people will get around. Those plans did, however, reduce the number of miles average residents drove per day. Likewise, a SANDAG analysis of SoccerCity, the plan to redevelop the former-Qualcomm Stadium site, found that project didn’t come close to meeting the city’s goal for getting residents to commute by transit, biking or walking, even though it’s exactly the type of dense urban project situated around a transit stop that the city is counting on. In other words, since the city adopted its lofty transit goals two years ago, new development proposals have routinely failed to meet the challenge – whether because of the region’s inadequate transit network, outdated modeling practices or insufficiently dense proposals. Now the city is simply going to stop checking new proposals against that standard. The city’s big goal for 2035 will remain, but we won’t know how each development plan stacks up against it as it’s passed. Jack Straw, director of land use for Mayor Kevin Faulconer, emphasized that the city still intends to meet the climate plan’s transportation goals, but said the focus on evaluating new projects on vehicle miles traveled is an acknowledgement of how hard it is to shift commuting behavior with development decisions alone. “It requires a lot of activities and policy goals to move the needle,” he said. 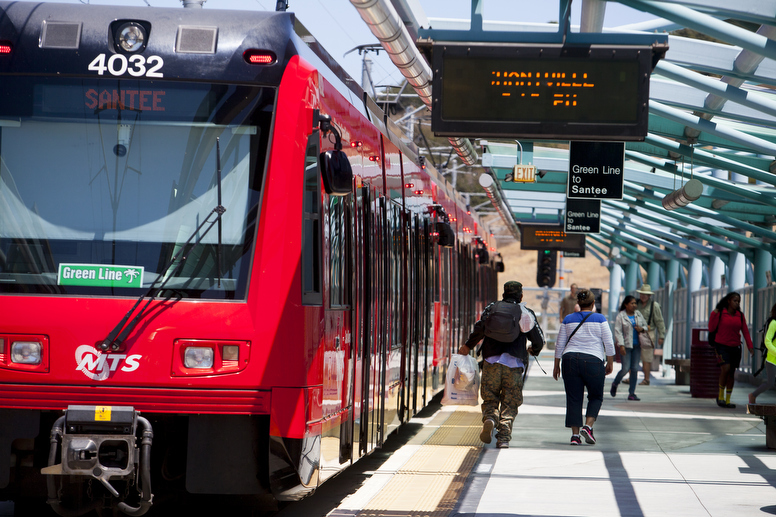 The city is in charge of land use decisions near trolley stations, but public officials at SANDAG could influence more change in commuter choice by spending more money on transit and less on highways, and MTS could do the same by increasing or decreasing bus frequency. In practice, the tool could be used to determine where the city should target increased home-building. “As an example, if two communities are primarily housing-focused, but one is closer to an employment center, it makes sense for growth to occur in the community that is closer to the employment center and would result in less (vehicle miles traveled),” the staff report for the item reads. It says the new method would provide a goal for how much housing and how many jobs each community should plan to accommodate. That means it could determine which community most needs to accommodate dense development – even if it can’t be used to say whether a specific community plan will do enough to change transportation choices. Nicole Capretz, who runs Climate Action Campaign, a nonprofit that advocates for cities to pass climate plans like San Diego’s, said the change is a loss for her efforts, because she could use a community plan’s transportation scores as leverage to negotiate for infrastructure projects that could improve them, like bike lanes or roundabouts. Now, the city’s analysis will just say what effect the development has on vehicle miles traveled – she’d like to have both. But she said it’s also a lost opportunity for the city, which could bring the missed transportation before regional agencies to advocate for more transit spending. I asked Straw if he was concerned that the city would be left to update community plans without knowing how they affect the city’s mode-share targets – even if it’s true that those plans are only one piece of changing commuting behavior. He said these are new decisions for everyone, and they’ll keep refining the process as they go if necessary. “We looked at other cities and how they monitor this, and there isn’t a standard protocol in place,” Straw said. Correction: An earlier version of this story said the city’s new tool wouldn’t pay any attention to how people commute. The tool won’t report how people in each community commute, but it will use citywide commuting behavior to help planners make decisions.